If you are looking for an easy way to unlock almost anything from your laptop to your car, you may be interested in a new locking device called the Everykey, which is being marketed as the only key you will ever need. Everykey is a proximity key fob that when close to your smartphone, tablet, laptop, car or even your house unlocks the assigned door or hardware, and when you walk away Everykey will then lock the device or property back down securely. Watch the video below to learn more about this very unique way of securing your valuables and property, which has taken to the Indiegogo crowdfunding website and has already raised nearly $100,000 thanks to over 625 backers. Its developers explain a little more about Everykey’s functionality, security and design. When you’re close to one of your devices, you can access it without a password. When you walk away, your device locks back down. Everykey manages a password keychain, which can be used to seamlessly log you into your website accounts when you’re around. Everykey can generate a secure and random password for you the first time you sign up for a website account. Everykey has a variety of safety features that work together to keep your information safe. 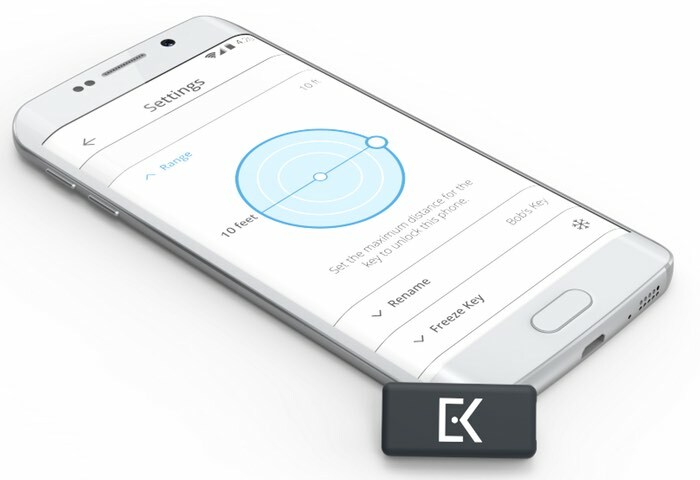 Everykey utilizes AES 128-bit encryption and has remote freezing capabilities which prevent others from using your Everykey in the event that it is lost or stolen. Each time Everykey broadcasts an encrypted Bluetooth 4.0 message, it is non-deterministic and pseudorandom. Device passwords are never stored on an Everykey server or product. All of these features together make Everykey secure and safer than what you use today. Our device passwords are always safe and secure as they are never stored on an Everykey product or server. Your Everykey broadcasts encrypted information to identify itself, which only your devices are able to decrypt. The passwords to your devices are stored on the devices themselves in an encrypted form within a keychain. For more information on the new Everykey jump over to the Indiegogo website for details and to make a pledge from $128 to be one of the very first to own an Everykey.